Bradley Manning: A Private in the US Army who released numerous secret cables and video evidence of American soldiers committing war crimes. When he was exposed, Manning was detained, held in inhumane conditions (according to both the UN and our own military), and charged under the Espionage Act—currently, he is on trial and is likely to spend decades, if not the rest of his life, in jail. John Kiriakou: A CIA agent who had knowledge of the Bush-era “enhanced interrogation” (read: torture) program and who became a source for several journalists. After he released information about instances of torture, including the identities of several agents who had tortured, he was arrested and charged under the Espionage Act. After legal proceedings began, Kiriakou eventually pled down to a sentence of 2½ years in prison—he is now currently serving his sentence. Edward Snowden: An independent contractor working for the government defense contractor Booz Allen Hamilton, Snowden released proof about several government spying programs to the media (Glen Greenwald and The Guardian). The programs that he revealed represent a huge data-mining program that is aimed at collecting huge amounts of online/phone data for analysis and, potentially, for scrutiny by intelligence analysts. After he leaked proof of this program, Snowden fled to Hong Kong and is currently attempting to evade extradition back to the USA. When the government and many in the media discuss whistleblowers, they inevitably begin discussing the concepts of loyalty and betrayal of oaths. Those who disagree with whistleblowers attempt to attack their character by saying that they have betrayed their oaths to their country and that they are disloyal for disobeying official orders and revealing secrets. While there is some validity to this argument, it represents an overly-simplistic and self-serving analysis of the concept of a whistleblower. A government whistleblower is a person who sees something illegal or immoral being done, in secret, by their government and risks their security by revealing proof of the wrongdoing to the public or to the media—they do not sell their secrets, rather, they give them away for free to improve accountability. Oftentimes, the release of these secrets is extremely dangerous to the leaker and the government attempts to target them for legal consequences (case in point: Bradley Manning’s inhumane detainment). In the past, whistleblowers like Daniel Ellsberg were protected and sometimes lauded for their revelations, but the modern era has seen a trend towards treating whistleblowers as traitors. 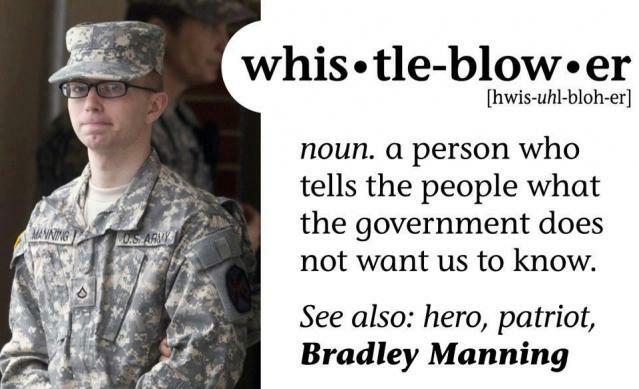 By definition, a whistleblower is disobeying orders and it is inarguable that they are violating some component of their oath to obey the chain of command. When he reveals secrets, a whistleblower may be violating his oaths and loyalties to his government/boss, but he is only doing this because those loyalties were overwhelmed by a greater loyalty to country and the American people. If the government—or a small part of the government—is doing immoral and illegal actions behind the backs of the American people, they have betrayed the trust of those who put them in power. As such, the person who reveals this betrayal may be betraying their co-workers, but they are the one who is truly being loyal to the American people. The NSA and FBI betrayed the American peoples’ trust, as well as the Constitution, when they decided to enact massive online spying programs that violate the 4th Amendment—everybody to willingly participate and cover up these programs is partly guilty of this betrayal. Out of these people who were involved, one (Snowden) decided to betray the others and expose their illegal actions to the American people. To Snowden’s former coworkers, this revelation is certainly a betrayal, but, to us, Snowden’s actions make him the only one of his fellows not to betray our trust. To put this into perspective and strip the complexities of technology from the equation, here is an analogous situation with a police department: A police department in the USA decides to enact a secret anti-drug program that illegally tracks the cash withdrawals and phone records of every person in their jurisdiction. This program creates an information dragnet over the jurisdiction that flies in the face of the 4th Amendment, but is secret and people don’t even know that they are being spied upon. After a while, an officer is transferred into the program and realizes how immoral it is but lacks the institutional authority to change it—his only chance to change this illegal program from being continued is to inform the public. Once he reveals the program to the press, the officers who were conducting the illegal program label him a traitor to the department because he brought about public scrutiny to their favorite program; they investigate him and try to charge him with a variety of offenses for his “crime” of revealing their criminal behavior. In this situation—as with the one on the federal intelligence level—the people who are calling the only honest officer a traitor are the ones who betrayed the trust of the public and who would persecute the only honest man in the room. Whenever you hear a government spokesperson describe whistleblowers’ revelations as a betrayal, you must keep in mind that the whistleblower betrayed the government, even at great personal risk, for your benefit. The government is certainly justified in hating the whistleblower and calling him disloyal—after all, the whistleblower did just betray them by revealing their illegal actions—but you should feel an equal level of gratitude to the whistleblower for the fact that they cared more to keep you informed then they cared for their personal safety, position of power, or coworkers. By letting your government go after those who blow the whistle on the illegal actions of the government, you are, in effect, siding with those who betrayed you over the person who always stayed loyal. Such a choice will only result in fewer people choosing to risk retaliation in order to keep you informed, and will eventually let the government act illegally with impunity. Josh, I really enjoy reading your articles and I agree with you on almost everything, except here I think you’ve made up your mind too soon, and as more information comes out about this NSA situation and the facts surrounding Mr. Snowden and his lonely past, you (especially you) shouldn’t have such a definitive stance on the guy when there are still many inconsistencies in his recorded allegations. At this moment, he still poses a serious threat to the security of this country and while it’s so easy to be seduced by the notion of a whistleblower/hero vs. big brother, do not sidestep the real issue here: that this has less to do with our 4th Amendment rights than the serious blunder in how our inflated defense infrastructure has gaping flaws. In this case, we have a failure of defense and security agencies to properly screen, hire, and then manage their contracted IT workers. Snowden has the makings of a megalomaniac, let’s not romanticize his infamy. He’s under educated, aloof, and clearly loving his time in the spotlight. And that is why he is a looming threat. Transparency in the dealings of our government has been an increasingly evolving issue since the birth of the internet, please don’t make the mistake in thinking the world is still just black and white. 35 years ago, the Supreme Court ruled that the Postal Service could record, or “mail cover” the fronts of envelopes, or the addresses of mailer and receiver. It would’ve been an infringement had they mandated that the content of those envelopes be recorded. Nothing has changed, except now we have emails. They track the record of an email being sent, not the content. Until you have proof stating otherwise, you’re just indulging a pipe dream. Don’t we want our government to have the capacity to read the content of terrorist emails abroad? It is good to hear from a regular reader, but I must respectfully disagree with you on your argument. First of all, I do agree that we need to wait for more information on Snowden before we make final judgement, but this is not the focus of the article–I use him as an example simply because he is the most recent person to release information on illegal programs. 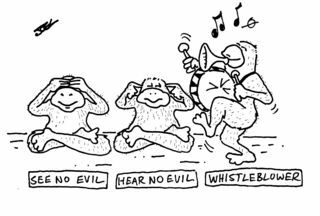 My point goes for whistleblowers in general and not simply a specific person’s case. As to your post office analogy: this isn’t actually a proper analogy, as the act of sending something through the federal post office can be construed as consent to let the government record the transfer of the letter (unlike with email, the post office is a government service); this is not, and has never been, the case with private correspondences in non-governmental channels (ex. it is not legal for them to demand package records from UPS without court order). In the case of email, the letters are being sent between two private parties, across a jurisdiction that the federal government has no reasonable right to consider their own, and it is a direct violation of the 4th Amendment. The scandal during the Church committee hearings, when the CIA was exposed in their tracking of telegraph connections, is a direct analogy to demonstrate how such eavesdropping is not constitutional. As to your arguments surrounding Snowden: I could care less about Snowden’s personality flaws, but the fact remains that the government hasn’t even attempted to deny the validity of his claims. In fact, we have reason to believe that the NSA is actually recording email texts and phone conversations without warrants and that this sandal will only get worse– http://news.cnet.com/8301-13578_3-57589495-38/nsa-admits-listening-to-u.s-phone-calls-without-warrants/ . There is a valid argument to be had about whether we want to trade a little more privacy for security from future terrorism, but that is a constitutional one, not a policy one. If you would like to support a constitutional amendment altering the 4th Amendment to include more exceptions for terrorism, that is an option, but, until then, this program is illegal and not on the table for discussion. Please don’t make the mistake of confusing constitutionality with practicality. Yes, the whistleblower is breaching their contract with a specific agency which employs them in service of their oath to protect the United States. Do you support people being more loyal to an agency that is breaking the law than they are to their country and the American people? P.S. Breach of contract and confidentiality agreements are nullified by serious criminal activity (ex. you can’t enforce such contracts when a soldier is blowing the whistle of war crimes).